(Caribbean Journal): Three fishermen have been rescued following a pirate attack on fishermen on Guyana’s Pomeroon River. 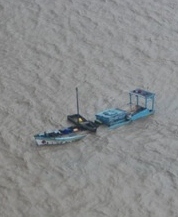 The pirates targeted approximately 15 fishing boats on Friday, in a spate of attacks which lasted for nearly 24 hours. “The Maritime Administration and Coast Guard received reports Friday of acts of piracy off the coast of the Pomeroon River, going up to an area called Kamwata Beach,” said Public Works Minister Robeson Benn. “The reports indicated that up to 15 boats with fisher folk were intercepted by persons who beat them, tied them up and imprisoned them in their boats.” Benn said the pirates reportedly stole the boats’ engines and other materials. Guyana’s Maritime Search and Rescue Centre was activated after evaluation of the situation, he said, and found several sunken boats and sailors adrift in the area east of the mouth of the Pomeroon River. According to Bharrat Kalicharran, captain of the Ms Davina, one of the vessels in the raid, he was attacked by six masked men, two of whom came onto his docks armed with cutlasses. “When we were about 15 knots away, just off the shore of Cozier village, they ordered us to lie down on our boats … they tied us up and beat us with cutlasses … before they left they bruk [sic] up we boat,” he said. Kalicharran said he had suffered a similar fate in an attack a year ago. The MRCC is continuing to monitor the situation.